(Nanowerk News) Researchers at MIT and elsewhere have found a way to significantly boost the energy that can be harnessed from sunlight, a finding that could lead to better solar cells or light detectors. The surprising finding is reported this week in the journal Physical Review Letters ("Quantum-Spillover-Enhanced Surface-Plasmonic Absorption at the Interface of Silver and High-Index Dielectrics") by authors including MIT’s Nicholas Fang, an associate professor of mechanical engineering, and postdoc Dafei Jin. The researchers used a sheet of silver coated with an oxide, which converts light energy into polarization of atoms at the interface. “Our study reveals a surprising fact: Absorption of visible light is directly controlled by how deeply the electrons spill over the interface between the metal and the dielectric,” Fang says. The strength of the effect, he adds, depends directly on the dielectric constant of the material — a measure of how well it blocks the passage of electrical current and converts that energy into polarization. Previous experiments showing elevated production of electrons in such materials had been chalked up to defects in the materials. But Fang says those explanations “were not enough to explain why we observed such broadband absorption over such a thin layer” of material. But, he says, the team’s experiments back the newfound quantum-based effects as an explanation for the strong interaction. 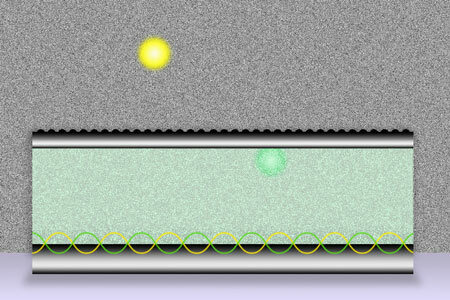 The team found that by varying the composition and thickness of the layer of dielectric materials (such as aluminum oxide, hafnium oxide, and titanium oxide) deposited on the metal surface, they could control how much energy was passed from incoming photons into generating pairs of electrons and holes in the metal — a measure of the system’s efficiency in capturing light’s energy. In addition, the system allowed a wide range of wavelengths, or colors, of light to be absorbed, they say. The phenomenon should be relatively easy to harness for useful devices, Fang says, because the materials involved are already widely used at industrial scale. “The oxide materials are exactly the kind people use for making better transistors,” he says; these might now be harnessed to produce better solar cells and superfast photodetectors. “The addition of a dielectric layer is surprisingly effective” at improving the efficiency of light harnessing, Fang says. And because solar cells based on this principle would be very thin, he adds, they would use less material than conventional silicon cells. 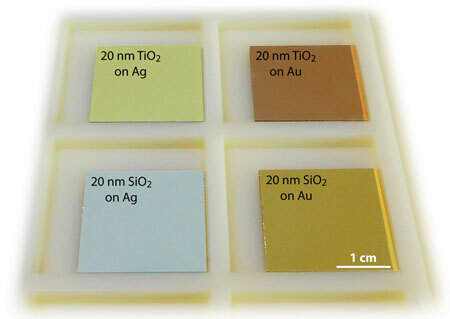 Remarkable color change when different dielectric thin films (low-index dielectric SiO2 and high-index dielectric TiO2) are deposited onto noble metals (Ag and Au). The color change is due to the light absorption via surface plasmons, which are strongly enhanced by the quantum spillover effect at the interface of a noble metal and a high-index dielectric. Because of their broadband responsiveness, Fang says, such systems also respond much faster to incoming light: “We could receive or detect signals as a shorter pulse” than current photodetectors can pick up, he explains. This could even lead to new “li-fi” systems, he suggests — using light to send and receive high-speed data. The team also included postdoc Qing Hu and graduate student Yingyi Yang at MIT, Daniel Neuhauser at the University of California at Los Angeles, Felix von Cube and David Bell at Harvard University, Ritesh Sachan at Oak Ridge National Laboratory, and Ting Luk at Sandia National Laboratories. The work was supported by the National Science Foundation and the Air Force Office of Scientific Research.